W. C. Durant (William Crapo) was born in Boston, Massachusetts, on December 8, 1861, but spent his formative years in Flint, Michigan. 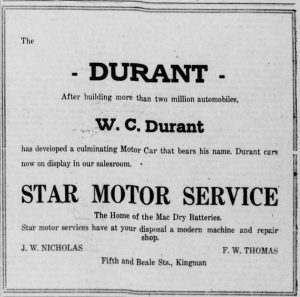 Abandoning high school to work in his grandfathers lumberyard, and pick assorted odd jobs such as a salesman for a local cigar manufacturer, Durant was a hard worker. 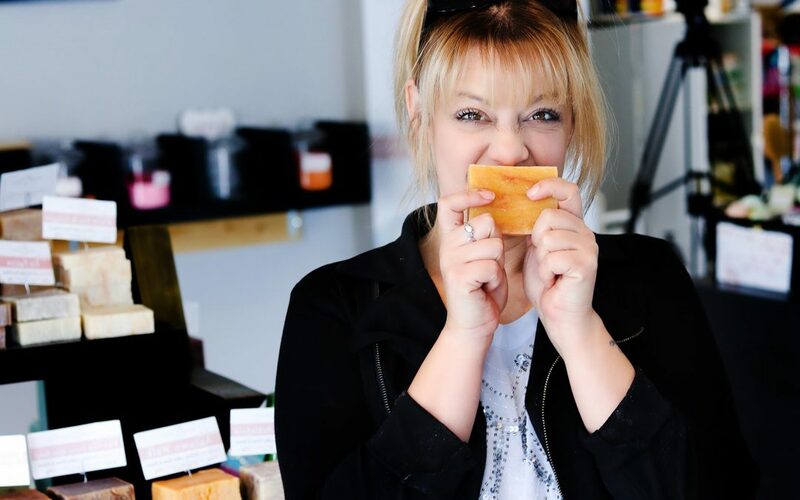 Jessica Deihl, owner of Savon Bath Treats one block north of Route 66, is a hard working young entrepreneur that juggles the tasks of motherhood with hours spent learning about soaps and oils, the making of soaps and bath bombs, and the management of her small shop. With an eye on the future a second store is being opened in Lake Havasu City. Durant also started small but dreamed big. Each job and project was parlayed into something bigger. After meeting with the developer of a suspension system that smoothed the ride of carriages and wagons, he found an investor and launched the Durant-Dort Company to manufacture carriages. As an historic footnote, Durant a bright young man by the name of Charles Nash to stuff cushions. Nash, abandoned as a child at age five, would go on to great things in life including president of Buick, and the founder of the Nash automobile company. By the mid 1890’s Durant’s carriage company was second to Studebaker as the largest manufacturer of carriages in the United States. But Durant was a visionary and in 1904 he acquired controlling interest in a nearly moribund automobile manufacturing company, Buick. In his quest to jump start sales he hired a team of racers and mechanics to promote Buick through racing and performance, the brothers Chevrolet, Louis, Arthur, and Gaston. An idea pitched by Benjamin Briscoe, a partner with Jonathan Maxwell, inspired Durant to dream even bigger. In 1907 when his attempt to purchase Ford Motor Company failed, he launched a new company that could provide a vehicle for every budget. The company would manufacture a low end car to compete with Ford, and luxury cars to compete with the likes of Packard and Peerless. It would also manufacture trucks, tractors and auto parts. The company was named General Motors. As with the owner of Savon Bath Treats, Durant was familiar with set backs and moving forward in spite of them. Through a complicated series of buyouts, leverage, and other means, Durant lost control of General Motors. In partnership with Louis Chevrolet, he launched a new company and began manufacturing an automobile that would become an American icon. Using Chevrolet he orchestrated a series of mergers, stock swaps, and stock purchases, and regained control of General Motors. By 1920 he again lost control of that company. Undaunted he launched a new company, Durant Motor Company for the manufacture of Durant and Star Automobiles, and Rugby trucks. His dealer network was international in scope, and included a branch in Kingman, Arizona. The corner of Fifth and Beale Street might be an ideal place for a monument to the entrepreneurial spirit. The Star dealership, Beale Street Brews, and Savon Bath Treats are all manifestations of that passion and that vision.